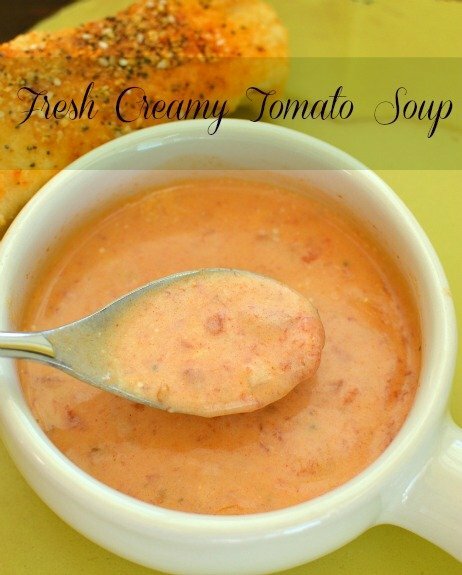 Everything about Fresh Creamy Tomato Soup is just right. Everything from the fresh tomatoes and onions to the most savory blend of seasonings! I seriously crave this hearty and pretty soup! Soup is one of my all time favorite foods! It’s the perfect comfort food! I have been looking for the perfect tomato soup recipe for a while now. My sister-in-law makes a killer creamy tomato soup. One of my favorite restaurants serves a chunkier tomato soup that is out of this world good. (I may or may not order it in July) I have been trying to recreate it for sometime now. First of all, I tried making it taste like their soup and making it healthy. I soon discovered that it tastes good for a reason! It’s all the heavy cream. I tried again after I harvested all my tomatoes and finally ended up with the soup I was dreaming of! 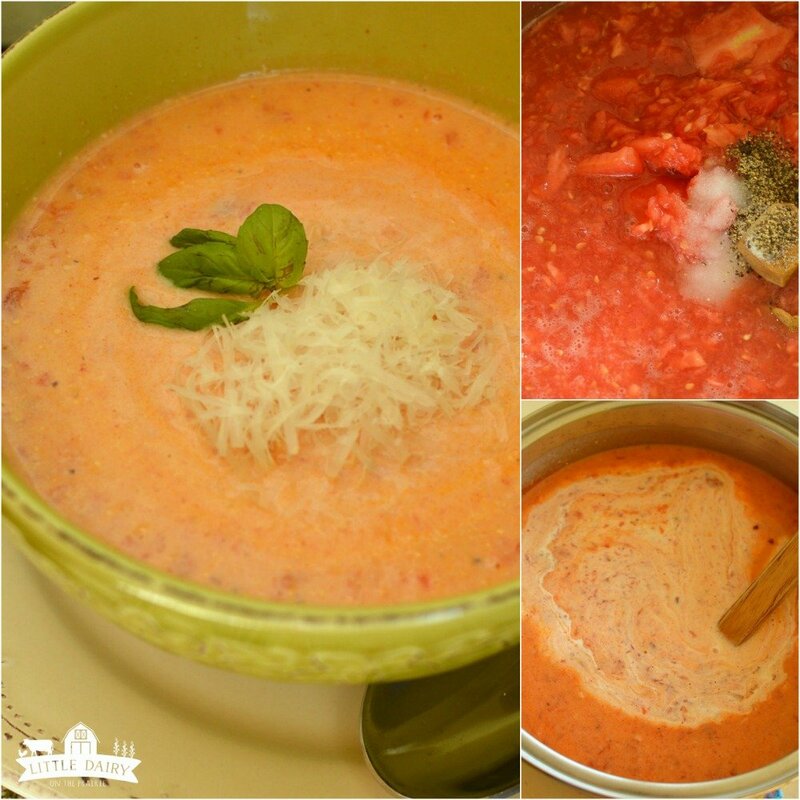 Warm your family up this fall with Fresh Creamy Tomato Soup! First of all, scald some clean fresh tomatoes. Scald them just long enough to make it easy to remove the skins. I used Roma tomatoes because that’s what I harvested from my garden. Besides that I wanted a little bit meatier tomato, and that’s a Roma. Peel tomatoes. Put a couple handfuls at a time in a food processor. Pulse. Little chunks are perfect in this soup. Pour tomatoes in a 6 quart pan. Add bullion cubes, salt, pepper, season salt, and red pepper flakes. Oh ya, and sugar. It balances out the acidity in the tomatoes. Let all of this simmer over medium heat for about 20 minutes. Keep stirring it. While all of that is simmering…saute some diced onions in butter until they get a nice golden color and are tender. Once they are done, add them to the tomatoes. Don’t let your kid help you with this part. They will surely dump the flour in the pan before it’s time. Oh well, he gave me a little kiss because he did it. Totally worth it! This is what you are supposed to do. Make a basic roux. Melt butter. Add flour. Stir and let simmer for a minute. Slowly add milk whisking to make sure you don’t get any lumps. Continue to simmer until thickened. Once the basic white sauce is thickened pour it into the tomatoes. Note: If you can’t imagine tomato soup with chunks in it, you feel the same way about soup as my middle child does! In that case, puree the tomato/onion mixture before adding the white sauce. 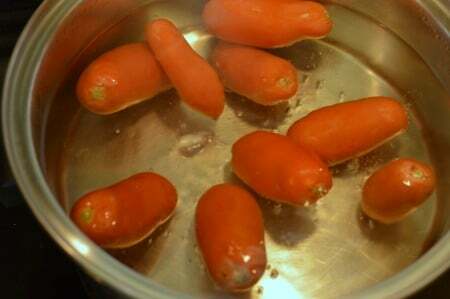 Stir the white sauce into the tomato mixture. Heat together. Add cream and half and half. Stir. This soup is divine served just the way it is. If you feel like getting all fancy you can serve it with grated Parmesan Cheese, sliced scallions, fresh basil, or croutons. Or you can go the traditional route and serve Fresh Creamy Tomato Soup right along side a grilled cheese! I’m not even lying to you, not even one little bit, when I tell you Fresh Creamy Tomato Soup is by far my favorite soup ever! 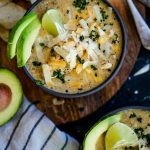 I do love other soups like Ranch Potato Soup, Creamy Southwest Chicken Soup, Creamy Chicken and Tortellini Soup, and Cheesy Chicken Gnocchi Soup, but this soup…it will always be my first love! 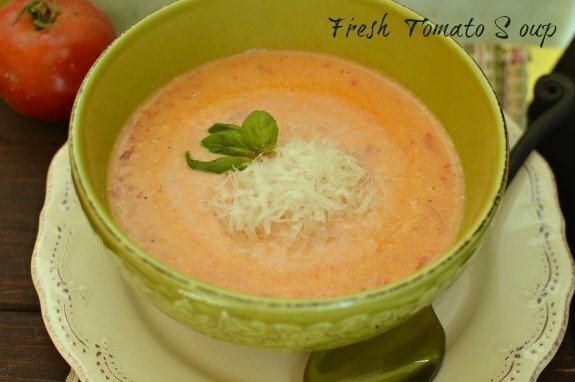 This creamy soup is unique because it has a fresh diced tomatoes and onions. The perfect blend of seasonings make it extra flavorful! Scald tomatoes. Remove skins from tomatoes. Pulse in food processor to chop until diced. Add tomatoes, all seasonings and sugar to large pot. Gently simmer for 20 minutes. 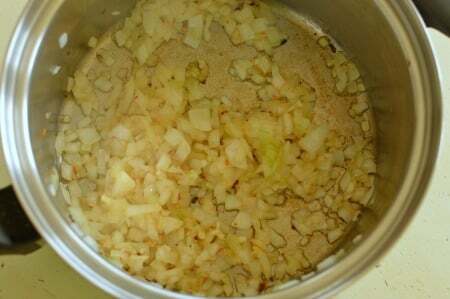 Saute onions in 2 Tablespoons butter until onions are tender. Add garlic during last minutes of sauteing. 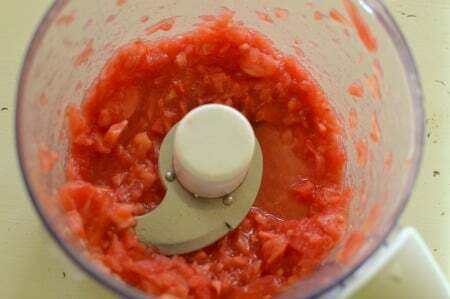 Once onions and garlic are tender add to tomatoes. Melt remaining 4 Tablespoons butter in sauce pan. 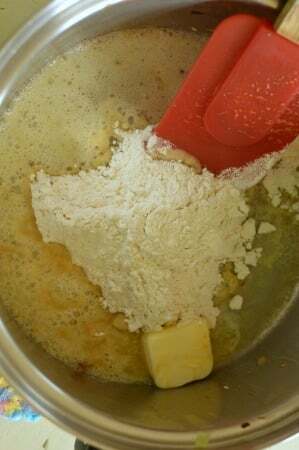 Add flour and stir together. Continue to cook over medium heat for a minute. Gradually add milk. Whisk to make sure there aren't any lumps. Continue cooking until thickened. 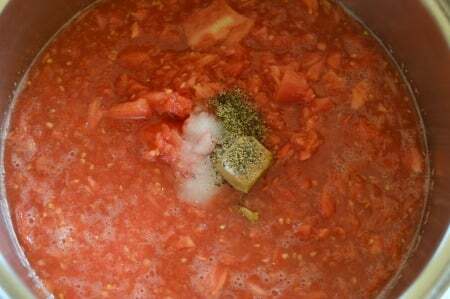 If you don't like chunks of tomatoes and onions in your soup, puree the tomato mixture. It's really good with hearty chunk's though! 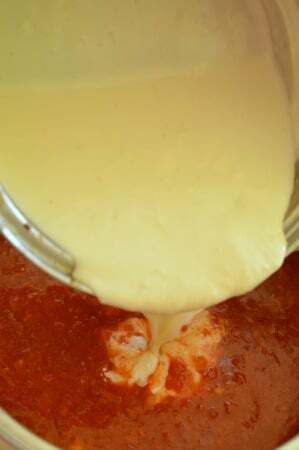 Add white sauce to tomato mixture. Heat through. Add half and half and cream. Stir together. 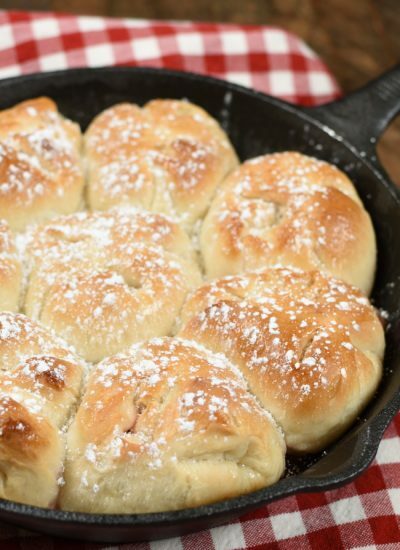 Garnish with Parmesan Cheese or fresh basil. I love soup too. It is another fast and easy dish to make and serve. I love Pyper’s homemade tomato soup too, but mine never tastes as good as hers. I will have to try really following a recipe this time and see if I can duplicate. I like chunks in tomato soup, so I am fine with that. I am not a saltine cracker fan though so I will have to use homemade bread or toast to clean out my bowl. Thanks for sharing, can’t wait to try it, and so glad to hear you are making it this weekend. Really, let’s make some bread to go with it. My kids still love the canned stuff! They have no sense of taste because this is WAY better! This soup looks delicious! I love a good soup at this time of year! Stopping in from Marvelous Mondays! Your soup looks delicious!!! 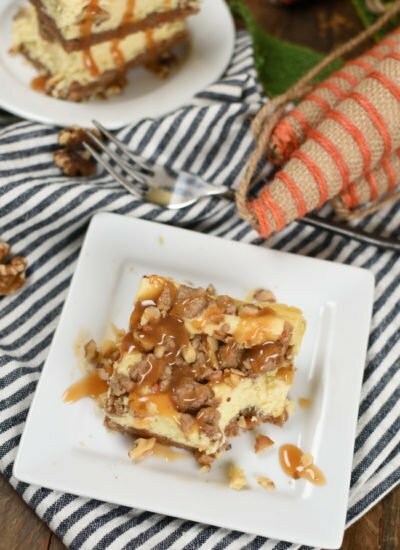 I am pinning for later! 🙂 Blessings! Tis the season for cuddling up to a warm bowl of soup! Hope you enjoy it! I’m glad it was such a hit! Thanks for letting me know, you made my day! Wow does this look good! 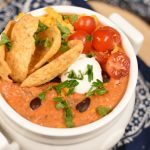 There is something about creamy tomato soup that is so comforting and DELICIOUS!! This time of the year it’s all about comfort food! I love warming up to a nice hot bowl of soup! This one always hits the spot!! There is nothing like a hot bowl of soup on a cold day! This one always hits the spot! Will be trying this soon. Always loved tomato soup and grilled cheese sandwiches. I had a windowsill full of garden tomatoes that needed to have something done with them, so I looked around for tomato soup recipes and found yours and THANK GOODNESS I did! It is DELICIOUS! I think it would be the perfect base for lobster bisque, too. There is nothing like fresh tomatoes straight from the garden! I think they are perfect in this soup too! Glad you found me and super glad you loved the soup! You reminded me how much I love it. Dinner tomorrow? It’s finally raining in California so this is on the menu for tonight!! Can’t wait! Yum! It’s my very favorite soup…EVER! Amy, That is sooo sweet. Your guys are very lucky. Thanks Keith! I’m lucky to have them! This soup is insanely good – I just made it for the first time and I’m not waiting until dinner to eat some! I put some fresh basil in the blender with the tomatoes and I didn’t have half and half so I skipped that part, and still SO DELICIOUS!! Thanks so much for this recipe! Yay! This soup is one of my faves, EVER! I substitute different kinds of milk for the cream, depending on how much fat I want to consume. No matter what it’s always good! I was wondering why cant you sauté onions and garlic then add tomatoes to pot? Why use two pots? 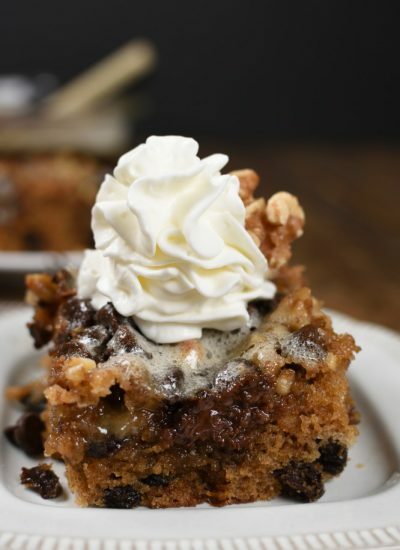 This looks really good and I am planning on making tonight. That’s exactly what I did last time I made this soup. Less dishes makes me happy! 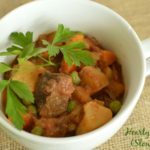 I’m sure you will love this soup! 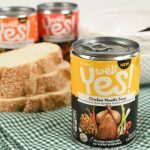 Can this soup be canned? I’m looking to use fresh harvested veggies and can for use during the winter months when they are not in season. Hi Desiree! I haven’t ever canned this soup so I’m not sure how it would work out. I prefer to make it in the winter using canned tomatoes instead of canningn the actual soup. That’s usually how I preserve my tomatoes for use in the winter! Maybe that would work for you? 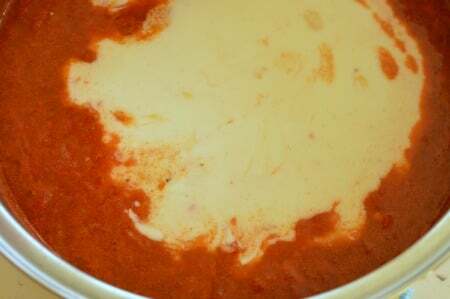 Your fresh creamy tomato soup. Can we freeze it in batches? 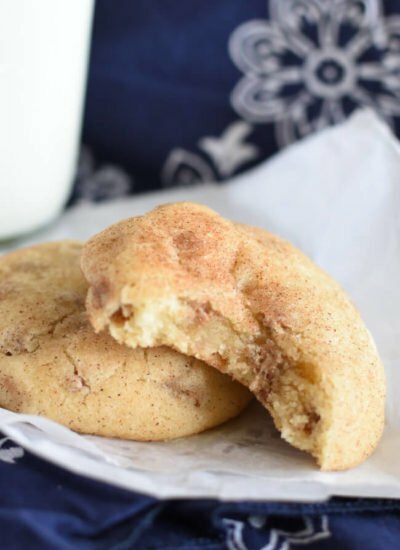 Does the white sauce (butter, flour and milk) preclude freezing? I haven’t ever tried freezing this soup so I’m not sure how it would work out. Let me know if you try it!